High Temp Cautery Pens have three primary uses for preppers and they are: 1) Draining the blood from a toe nail, 2) Starting a fire, and 3) To help stop minor bleeding quickly. They are also have a special application for fly fisherman who make their own flies. The cautery pen aids in cutting the fly ties and to remove loose fibers and hair. "This is the same unit that is used in the Emergency Rooms to cauterize small bleeds. The tip gets VERY HOT and can cause severe burns if used incorrectly, therefore, it is for professional use only if used on animals or humans. It can also be used to melt plastic for fly ties or for melting plastic ropes to prevent fraying." "clots an open wound well." "I got tired of paying a dermatologist $600 to burn off my skin tags....touch the head of the skin tag slightly....wait a day or two and it falls off with no scars!" "good product. heats up instantly. i use this to remove moles"
"It works. does what it says, cauterized and lances just as you would expect. gets hot in 1 sec. I say use with caution." "Works well to remove skin tags. Do not use on really sensitive areas." "This is similar to what is used at the dermatology clinic, but should only be used by experienced professional. Would be a good tool for wood burning"
"....not intended to have the two AA batteries replaced. Having said that, I tie a lot of flies (not commercial type numbers but I tie most every night) and have used this for more than a year and it's still going strong." The following YouTube video covers important safety instructions when using a cautery pen. The following YouTube video shows how to control bleeding with a cautery pen. Through corresponding directly with Dr. Ryan Chamberlin (trauma surgeon), he recommends having a High Temp Cautery Pen in Doomsday situations for preppers. See the two Blog posts (linked below) from ThePrepperPages.com for more details from Dr. Ryan Chamberlin concerning why every prepper should have a cautery pen for doomsday situations. Also, see the YouTube videos above for a cautery pen safety instructional video and how to use a cautery pen to control bleeding. Dr. Chamberlin is the author of the medical survival book Surviving the Zombie Apocalypse: First Aid Kit Building and Mini Med School for Preppers. Use at your own risk. In normal times (not end-of-the world times), for cauterizing wounds, cautery pens should only be used by medical professionals who are trained to use them. Please note that the information provided on this web page is for information only. TopSurvivalPreps.com and it's owner have no liability or responsibility for anyone using any items described on this web site including Cautery Pens. Anyone viewing the content of this web page is responsible for doing their own research and for making their own decisions including using Cautery Pens. 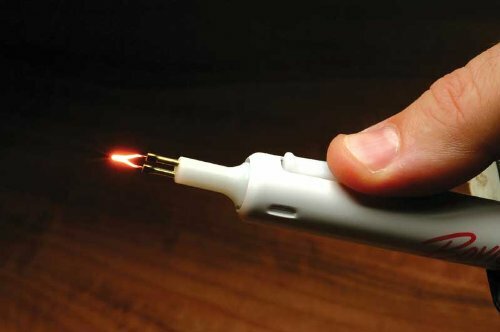 Cautery pens are dangerous in that they can create heat in excess of 1000 degrees and can cause burns, start fires, or ignite combustible or flammable materials. Please see the Cautery Pen Safety Instructional Video below. Cauterizing wounds should only be performed by trained medical professionals. Preppers may want to secure this cautery pen so that they have it on hand for a trained medical professional in their network, or they may want to pursue the required medical training themselves.